Usne Kaha Tha Alvida Urdu Poetry book Authored by Misbah Mushtaq. Us Ne Kaha Tha Alvida is a collection of social romantic Urdu poetry and Ghazals. Ms. Misbah Mushtaq Sahiba is a talented social worker, writer and poet of Urdu language. She wrote many beautiful collection of Urdu poetry like “ Aik Tu Na Mila”. Recently she wrote her first interesting and emotional Urdu novel “ Pathar Kardo Aankh Mein Aansoo”. 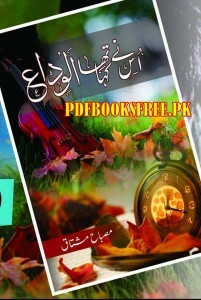 This poetry collection of Misbah Mushtaq Sahiba contains Urdu romantic Ghazal, Urdu poem and other social poetry. You can find sweetness and pain of love and romance in her poetry. On the other side she promote brotherhood, respect of each other (especially for women) and tolerance. Her poetry collection “ Us Ne Kaha Tha Alvida” is now available on Pakistan Virtual Library for online reading and download. Checkout the following links to read online or download the complete book in Pdf format to enjoy offline reading. For more information please visit Misbah Mustaq facebook official page or visit her personal website @ www.misbahmushtaq.com.